The state of the “recovery” in six compelling charts. After the recessions that began in 1990 and 2001, it took 30 months and 45 months, respectively, to regain the number of jobs lost. It’s been forty-five months since the start of the Great Recession, and the US is not even close to regaining all the lost jobs. The number of US civilians dropping out of the labor force is rising at an increasing rate. Four years after the start of the Great Recession and the number of Americans on Foodstamps continues rising. Home prices in the vast majority of the cities most affected by the housing depression continue to fall. 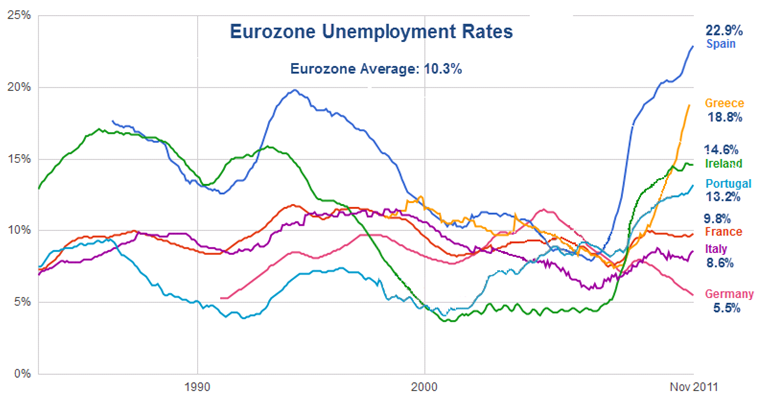 Unemployment rates are soaring in Spain, Greece, Ireland and Italy, despite the fact that these countries have accomplished next to nothing regarding their crushing debt problems thus far. What will unemployment in these countries look like after a few years of austerity? The chart below shows that fixed income returns were positively related to credit quality in 2011 (which ended the year in “risk-off” mode). Thus far in 2012, fixed income returns have been negatively related to credit quality (suggesting an abrupt shift to “risk-on” mode). Is it time to take some profits from the overbought US stock market and play a little defense? Note that equity markets started 2011 with a similar risk-on surge, only to correct sharply in the spring and even more sharply in late summer and early fall. Howdy! I’m at work browsing your blog froim myy new iphone 3gs! Just waanted to say I love reading through your blog and look forward to all your posts!